Oh dear. Here in Europe I'm now not supposed to call Gmail anything other than Googlemail. This is not going to be easy. I still call GTalk "cricket" which was the development code name for the project. Is it GTalk or Google Talk anyway? Cricket sounds better. In a "new for me exclusive" I've just noticed Gmail (sorry, Googlemail) using the Cricket (sorry, Google Talk) sidebar to try and lure me into luring in friends. Google doesn't do 'social media' very well right now. Google Notepad - remember that? Google Coop - remember that? When Google ties in the Google Talk contacts into the web then we'll have Google doing 'social media'. 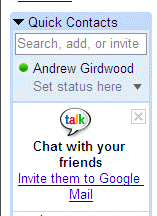 I predict we'll see little green buttons around the web to indicate when your Google Talk contact is on or off line.